Yes! You will need a stylist to assist you. Why? There are so many options available to you that we want to make sure you don't miss out on the perfect combination. From colour and fabric options to ordering times, you will need your stylist's help. Not making an appointment may result in a long wait time as our appointments run from 30 to 90 minutes (depending on the service) and are booked back to back. Should I go to your Ottawa or Gatineau boutique? 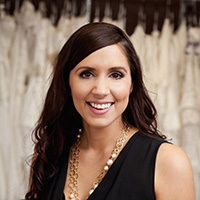 Our wedding dress inventory is extensive in both boutiques and completely different. The Ottawa location offers a trend setting inventory from designers such as Éloise Marie Couture, Maggie Sottero, Sophia Tolli, and more. The larger part of our inventory is from $1200 to $4500. Our Gatineau boutique is the largest bridal outlet in the region. With discounted designer gowns and one of a kind creations up to 70% off. We have a large selection of gowns under $1000. Say yes to your dress for less at our Gatineau boutique! How much are your wedding dresses? We try to cover many price points in our stores. We want every bride who walks in to be able to say yes to her dress! Our Ottawa location focuses on mid points ($1000 to $4000) and Our Gatineau location (which is the largest bridal outlet in the area) focuses on discounted designer dresses (under $2500) with a large selection under $1000. No we do not. While we do not rent wedding gowns, I do think you should visit our boutiques. Most of the time we get that question from brides with champagne taste and a more modest budget. In this case our Gatineau bridal outlet is perfect for you. Our designer gowns are are discounted up to 70% off. Come say yes to your dress for less! Do you buy dresses from the public? No we do not. If you are looking to resell your gown, there are many local Facebook groups and bridal resale websites where you can list your items. What sizes do your bridesmaids dresses come in? Our bridesmaids dresses are available from size 0 to 30 at no extra cost. Many styles are available in junior sizing and/or maternity. Special options such as lace-up back, extra length, custom measurements, extra flowers, etc., are available at extra cost. Can we do bridesmaids at the same time or on the same day as my wedding dress appointment? It is best to find your dress before you start looking for your bridesmaids. Most bride find it overwhelming to do both at the same time. If you absolutely need to do both the same day, we charge a nominal fee of $100 to reserve 2.5 hours of our staff time. If you purchase the same day it is credited on your purchase. There is no refund if appointments are canceled. Let's Find That Perfect Dress!